Hey there! Happy Wednesday everyone! A few weeks ago when I showed you my new-to-me green lamps in the entry, I mentioned that I was hunting for a new rug for the space, and that I might have stumbled across one. Well, I happened upon the right sale at the right time at RugsUSA and picked a winner! Although it's navy, I took a chance because it looked really dark on the screen. It IS dark, but still noticeably blue. The front corner of the photo below is a good representation of the true color. I'm not sure how I feel about that mix in here, but it's growing on me. And, I was sure that if I didn't think it was a good fit in the entry, that I would use it in my bedroom. So, it may be moving in the future. All of that white by the front door makes me a little nervous. So, although I love this one, it may not be in it's forever home. I'll still have my eye open for something else for this spot if I move it elsewhere. I was a little nervous about buying a rug online, but since I knew I had a back-up spot for this to go I didn't worry. Although RugsUSA has a good return policy, I didn't want the hassle of sending it back if I didn't like it (I don't believe they pay return shipping). 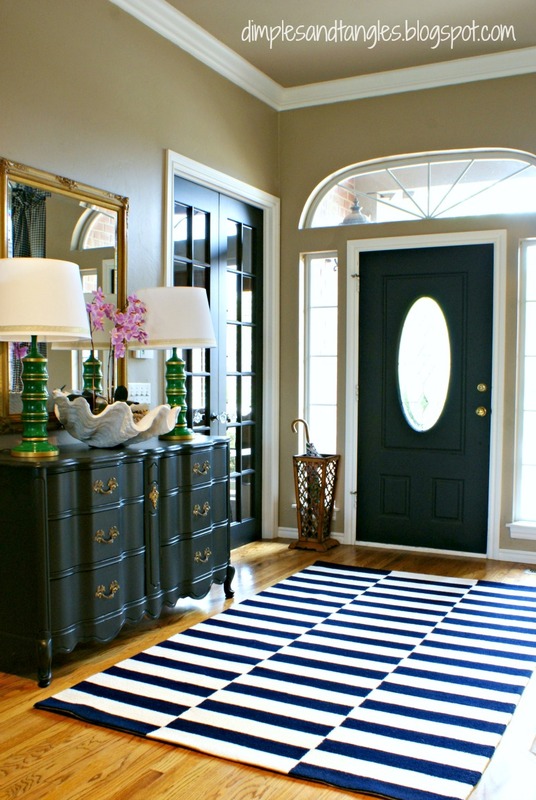 One thing I have noticed on their site, it's really hard to find good larger rugs that are a TRUE black and white or cream. Most of them are charcoal, which reviewers say tend to have a blue-ish tint. They truly have the best prices when you catch a good sale, but when you're looking for something as specific as I am the search can be tricky! I'm still on the hunt for a few other rugs, so I'm still looking at options. I'm happy for now, though, this one will work! **By the way...this isn't a sponsored post, just passing along my thoughts about my new purchase! Oh, I LOVE the blue mix in of color! This looks great! It is absolutely stunning in that space. It would be a shame if you were unable to keep it there but I can understand - I constantly have people walking in and using my entryway rug as a doormat! I love it, even if it's navy blue, it's dark enough to work and adds such a graphic punch to your entry! I am living vicariously through you - in my house that gorgeous rug would covered in dog fur and muddy foot/paw prints in about an hour! I think it looks great! I love the navy with the green lamps. I love anything with stripes, looks great! I love your mix with the bold stripes! I'm such a chicken when it comes to buying a rug online. Ikea had one like it in b & w, but was discontinued I've heard a lot people complain about that decision. I'm with Lisa, white wouldn't work for our entry! I'm with your friend Pat on this one. I'm afraid this rug makes my head spin just to look at it. 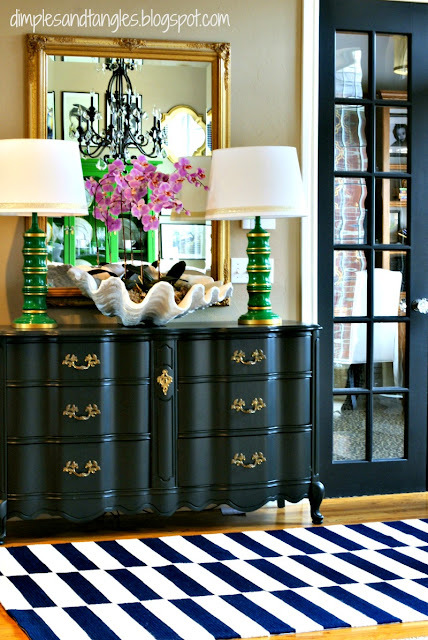 I really like the umbrella stand and the white trim. I like your old rug but agree that it was too small. I can see why you wanted a larger one. It looks lovely, so crisp and lively! i like it! i can see that it would take getting used to because it is a big change, but i really like the modern edge it adds! Funny girl! :) I really love stripes...and I love the navy...and I think it looks awesome. I would hesitate to have the white in the entry but that's just me. I think it looks beautiful with the green lamps and the black furniture. Great selection! Oh, and I have finalized a place to move to end of June. If you decide this is not going to work for you, send it on down! LOL Seriously, I've decided to paint an accent wall in the new bedroom navy and already gathering decorative items. This will be fun! You should plan a trip down here and help...you're so talented and have such a penchant for color. You know we'd laugh our heads off in the process! Love the new rug! Such a great look. I have my eye on a rug from that company as well. The free shipping is such a major factor when buying a large rug. Since this was not a sponsored post, I wonder if you would talk about how your rug was shipped, (which carrier), did the delivery people actually bring it inside your home, and how did you get it to lay so flat after being rolled so tightly during shipping? All things I have wondered, worried about as I live alone. Thanks for your insight. Big change, for sure, but it really contemporizes (real word??) your entry. Great that you have a backup spot if it doesn't end up working for you here because it's a great rug. Even if you switch it, I'm loving a graphic rug there! Lovely!! 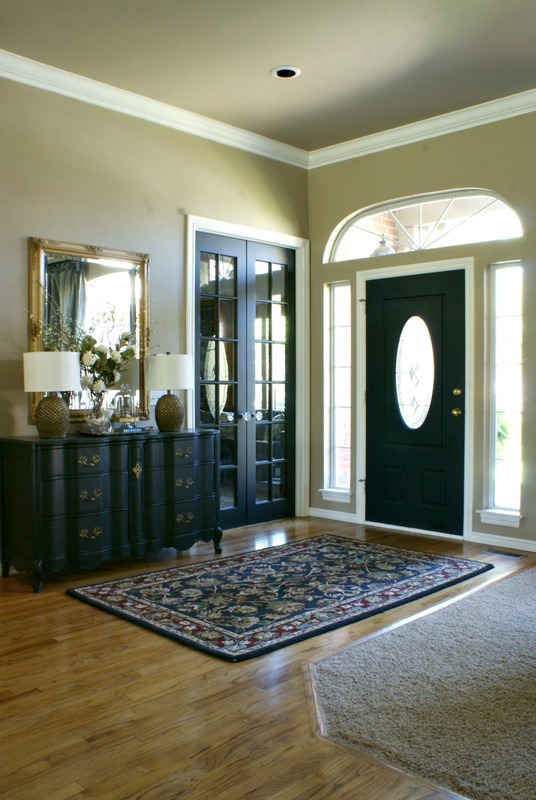 I agree with Jennifer - it does really 'contemporize' your entryway. It looks great! I love the whole space. 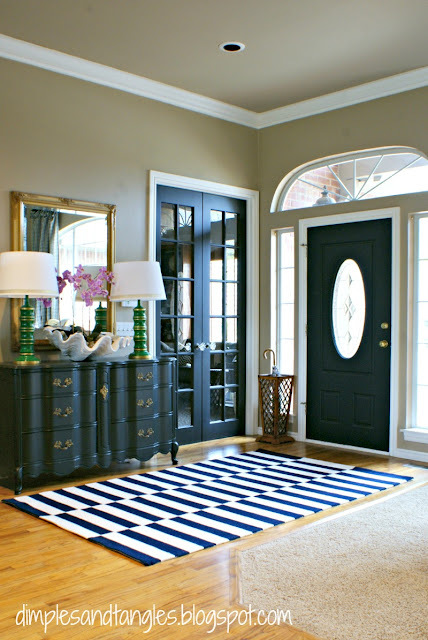 Forgot to mention, I think I've seen a black and white stripped rug at ikea, in case you decide on the switcheroo. I love this entry update, it is really bold and just perfect! 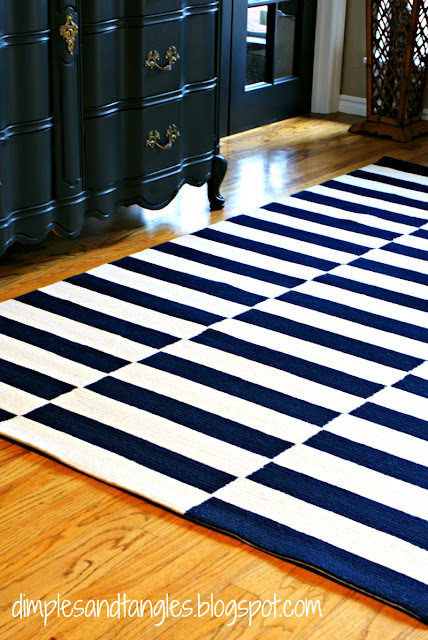 I saw the striped rug back in stock at Ike's last night, bu t not being too Kathy-matchy is very designer like! to thank you for ones time due to this wonderful read! and colorful. Very nice either way. it as our first home many years ago was bright yellow, green and white.